I was cleaning out our freezer this week, I try to do this about every 3 months. I don’t want to eat any weird science projects. As I was going through the freezer, I noticed I had some leftover raspberries from this summer and again, I got excited because it reminded me of summer and warm sunshine. It’s been below zero everyday this week again,but I am so excited for this weekend because it’s suppose to be 20 degrees! Whoop Whoop above sub-zero temperatures, I know it’s so sad that I am excited about temperatures in the 20’s. And it looks like it’s going to be even colder next week, oh fun! 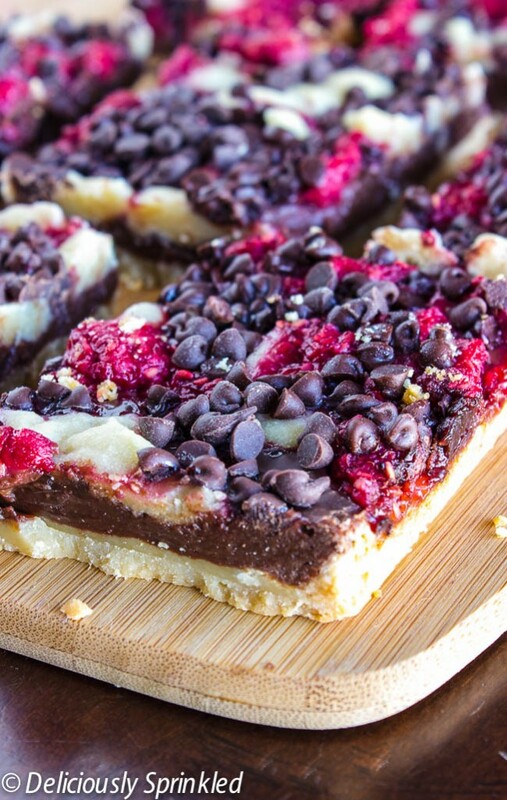 So I thought I would bring the taste of summer to our apartment by making these dark chocolate raspberry pie bars with the frozen raspberries I found. If you don’t have raspberries, no worries you can use raspberry jam. 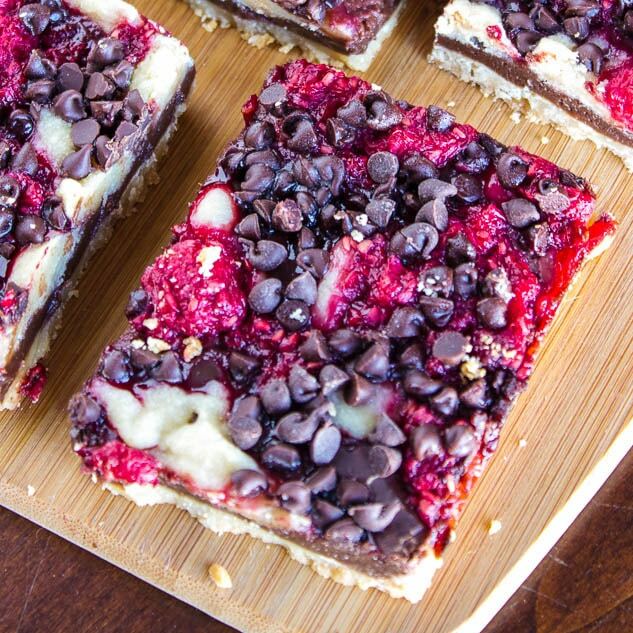 Whether you stick to the raspberries and chocolate chips or change it up, one thing is certain…these little pie bars will be a year-round family favorite. ● BUTTER: 1 cup (2 sticks) butter. 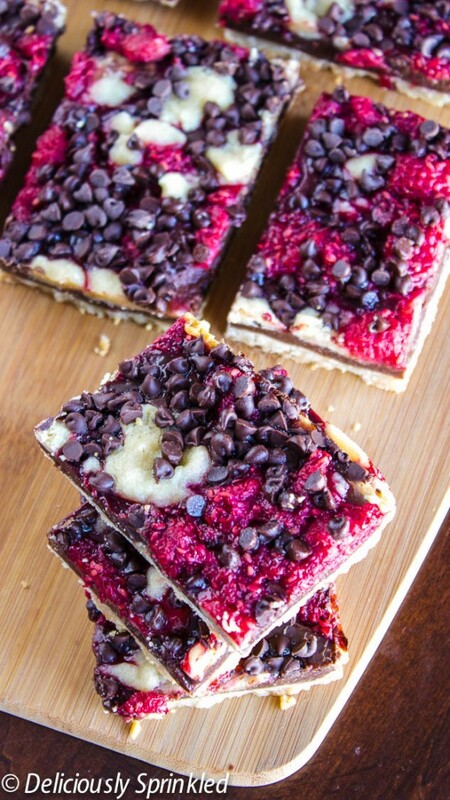 Make sure the butter is softened to room temperature before making these bars. ● FLOUR: 2 cups of all-purpose flour. ● BROWN SUGAR: 1/2 cup of light brown sugar. ● SALT: 1/4 teaspoon salt. ● DARK CHOCOLATE CHIPS: 1 cup dark chocolate chips. ● MINI CHOCOLATE CHIPS: 1 cup mini chocolate chips. ● SWEETENED CONDENSED MILK: 1 (14 oz.) can sweetened condensed milk. ● FRESH RASPBERRIES: 3/4 cup fresh raspberries. PRE-STEP: Preheat oven to 350F degrees. Generously spray 9×13 inch baking pan with non-stick baking spray. Set aside. STEP 1: In a large bowl, using an electric or stand mixer, mix butter until creamy. STEP 2: Mix in brown sugar, flour and salt continue mixing until crumbly. STEP 3: Press 1 3/4 cups of crumb mixture into prepared baking pan. Set remaining crumbs aside. STEP 4: Bake for 10 to 12 minutes or until lightly golden. STEP 5: While the crust is baking, pour sweetened condensed milk in small sauce pan and add one cup of dark chocolate chips. Stir over low heat until chocolate has melted and mixture is smooth. STEP 6: Remove crust from oven and pour chocolate mixture over warm crust. STEP 7: Sprinkle remaining crumbs evenly over chocolate layer. 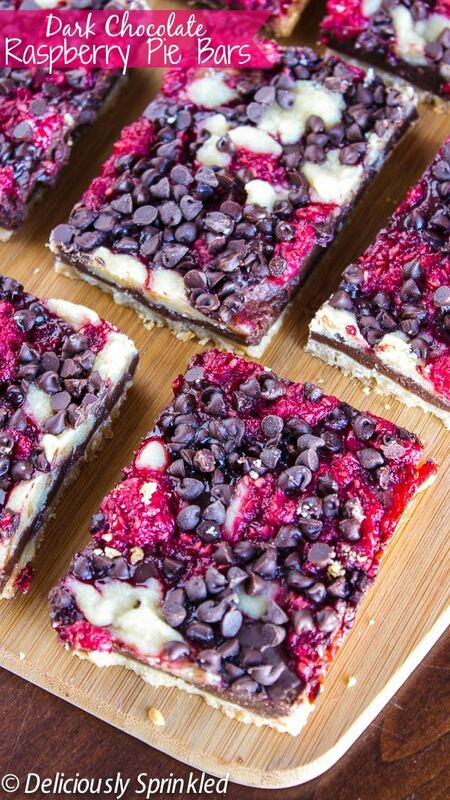 Spoon raspberries over crumb mixture and top with mini chocolate chips. STEP 8: Bake for 20 to 30 minutes. Let cool before cutting into bars. LINE YOUR BAKING PAN: To make it super easy for you to cut the brownies into squares, line your 9×13 inch baking pan with aluminum foil, leaving enough overhang on the sides and spray the foil with non-stick cooking spray. Once the brownies have cooled, lift the brownies out of the pan, folding down the aluminum foil sides. Then use a sharp knife to cut the brownies into squares. SUPER EASY! CRUMBLE TOPPING: Make sure that you leave enough crumble mixture to sprinkle on top of the raspberries and chocolate chips. CHOCOLATE CHIPS:I used dark chocolate chips to make these bars but if your not a big fan of dark chocolate and want these bars to be a little more sweeter, you can use semi-sweet or even milk chocolate chips. KITCHENAID MIXER: I love my KichenAid Mixer, it makes baking so much easier! 9X13 BAKING PAN: These are the best baking pans for making dessert bars. SMALL MIXING BOWLS: These are great small mixing bowls, perfect for making the crumble topping. Preheat oven to 350F degrees. Generously spray 9x13 inch baking pan with non-stick baking spray. Set aside. In a large bowl, using an electric or stand mixer, mix butter until creamy. Mix in brown sugar, flour and salt continue mixing until crumbly. Press 1 3/4 cups of crumb mixture into prepared baking pan. Set remaining crumbs aside. While the crust is baking, pour sweetened condensed milk in small sauce pan and add one cup of dark chocolate chips. Stir over low heat until chocolate has melted and mixture is smooth. Remove crust from oven and pour chocolate mixture over warm crust. Bake for 20 to 30 minutes. Let cool before cutting into bars. *Store bars in an airtight container at room temperature or in the fridge for up to 5 days. 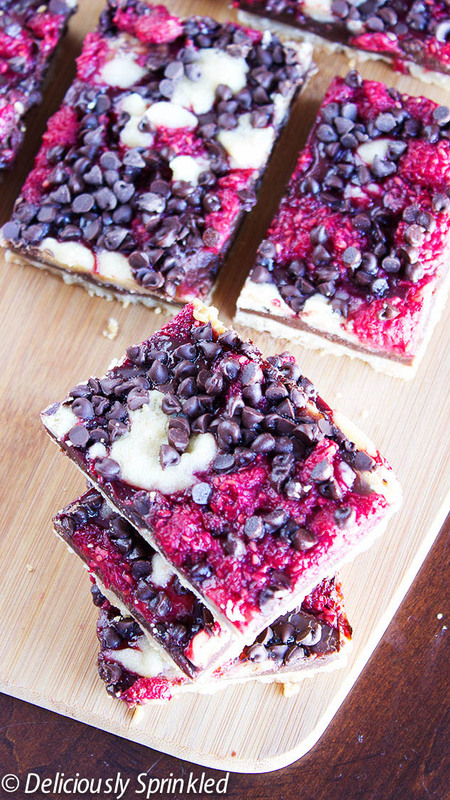 I made these and added a shot of Chambord to the chocolate and sweetened condensed milk….gave a nice raspberry tinge to the chocolate! Did you recently make some changes to this post? I’ve made this recipe countless times with no problems, but now when I look at it there are ingredients and their measurements missing from the list!! The ingredients list no longer tells me how much condensed milk is needed, or how much butter! Thankfully I scrolled through the comments and can figure out the butter from another poster, and thankfully I’ve made it enough to remember that it works out to about 1 and 1/3 cans of condensed milk, but I thought I’d draw your attention to it! I checked out the recipe on my phone and on my computer so I’m not sure what happened? Thank you SO much for bringing this to my attention. My site got a update recently and some of the recipe ingredients did not transfer over correctly…I’m trying to go through ALL my recipes to see which ones need to be fixed and I appreciate it SOO much that you brought this to my attention so I can fix it ASAP!! THANK YOU!! I made these not too long ago and they were delicious. I want to make again, but for some reason the ingredients list looks like it’s missing ingredients. Can someone tell me the list please?! I’m so sorry! My site recently went through a update and some of my recipes didn’t transfer over correctly! I’ve been trying to go through all my recipes to make sure they updated correctly and I appreciate you bringing this to my attention so I can fix it ASAP! I had to leave a comment because I just made these and they are absoultely delicious! I put them in the freezer after they cooled a little and then cut them. This recipe is definitely going to be used again and again! Thank you! Hi there! I’m just wondering if these can be frozen after baking? After reading all the positive comments I’m hoping to make some for the holidays! I’ve made these a few times now. They’ve gone into my “perfect’ folder in Pinterest, and they are just about perfect. I find they’re a much nicer texture when cold. So I serve them straight from the fridge. I used gluten-free baking mix and it turned out great with a couple of changes. When using the amount of flour outlined in the recipe, it came out much runnier. I had to add about one cup more than regular flour. It still wasn’t crumbly but more like pie dough. I also had to cook it for about 25 minutes. It worked out great. Thanks for this amazing recipe. 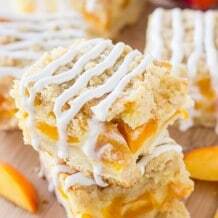 I want to make this recipe as a desert for Thanksgiving and need to make them a few days before serving them. I want to try your suggestion to put aluminum foil in the bottom of the pan. Is it OK to store the whole thing in its glass 9×13 baking pan, with its cover on and aluminum foil still at the bottom, and cut them right before eating a few days later? Or do I need to remove the aluminum foil soon after baking, cut them, and put them in a different airtight container? That should be totally fine! 🙂 Happy Thanksgiving! Wow, these bars turned out AMAZING! I was making them for a family friend, but I saved some pieces for my family and they all got after me for not making them all for them! I loved them too…they turned out amazing. They were so easy, too! Being the first recipe I’ve tried on your blog, I will DEFINITELY be trying more! Thanks! I have not made these yet. I just noticed in the picture the mini chocolate chips on top don’t look melted from baking. Do you bake with the mini chocolate chips on top?? Will they melt and become all gooey if you bake it with them like the directions say? Thanks, this recipe looks fantastic, I’m going to make it tomorrow. Jenn: Love your blog and all your sweet recipes!!! Especially these bars. Made a batch for hubby’s office and also Thanksgiving dinner and both times they were a bit hit! So, I knew I had to share it with my readers on my blog. I’m sharing the recipe on my blog tomorrow and linking you back of course! how do we store them after making? You can store them at room temperature in an plastic container for up to 5 days. These were SO yummy! (Even though I did the crust crumbs on top wrong and put them on before the chocolate…oops) For my dad’s birthday present we are watching this season of The Amazing Race together and I am providing dessert each week. This was proclaimed the favorite thus far! I finally made these the other day (pinned them from pinterest ages ago!) and let me just say: they were AMAZING!!! So easy & quick and so so delicious! 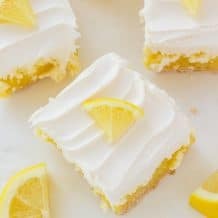 In the picture there are white dollops of what looks like frosting or cream cheese but I don’t see anything in the recipe for them. What did you use? I saw someone else asked the same question and you responded with pic crumbles, but these white dollops don’t look like pie crumbles. Thanks for your time! Would it be safe to send these in the mail to a friend? I have never mailed these bars before but I wouldn’t recommend mailing them. Oh my! I just made these with fresh cherries since that’s what I had on hand and they were spot on! They were still pretty warm (cause it’s in the 90’s here today which probably made it difficult for them to cool off enough) but they were fantastic. Just put them in the fridge and I can’t wait to have another after they’ve cooled some more. Hi! How many ounces/grams of chocolate should I use? Thanks! Hi, Karina! Please use 8 ounces of chocolate chips in this recipe. Making these for Easter tomorrow! Very excited! wow! Pinterest brought me here. . . and these are definitely on the list of *create now! * !! These look amazing and I can’t wait to try, but I can’t figure out what the white is in the picture? I thought white chocolate was in there too but it isn’t. What is the white? These look great! What are your thoughts about using fresh berries? Or how about a mixture of fresh and frozen? I used all fresh and they came out GREAT. I doubled the amount of fruit, though, b/c I wanted a fruitier ratio. I only had a 9×11 pan so mine are a little more deep dish. I also added a little bit of blueberries and strawberries b/c I had them on hand and I felt like I didn’t have enough fruit topping. They’re in the oven now, I guess we’ll see! Turned out awesome! I used brown butter b/c i’m addicted, but i think it was a little too much, next time I’ll use regular. DEFINITELY making these tasty treats again. Thank you! Would this recipe also work with milk chocolate? Or would that change the taste completely? 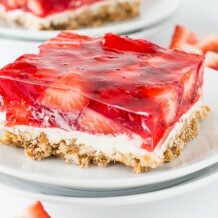 I saw the pic for this dessert on Pinterest and just had to check it out. Although I’m a Ninja on the grill — I’m more like Gilligan when it comes to baking so I was glad to see the directions were straight forward and something I can handle 🙂 Thanks for sharing this amazingly beautiful (and I’m sure amazingly tasty too!) recipe. Are these bars best served cold or warm? When it comes to baking, I’m a newbie. So, is this recipe difficult? 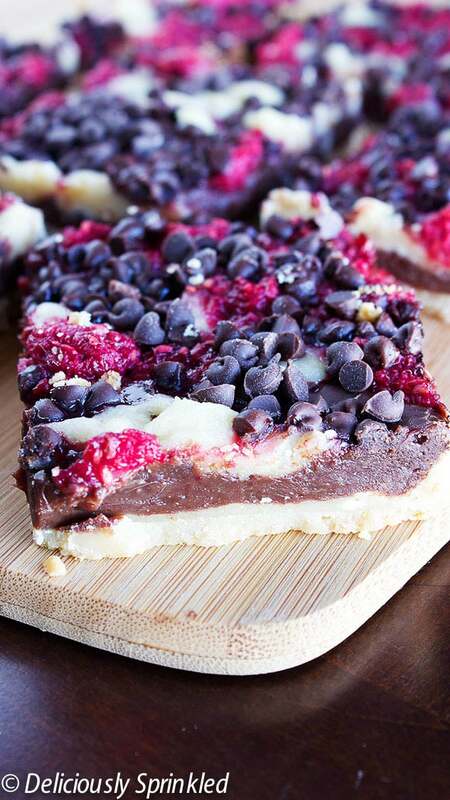 This looks like every single thing I desire in a dessert: raspberry, dark chocolate, and pie inspired. I’m drooling. Could you tell me, how much butter in grams you use? And what could I use instead of the condensed milk? I couldn’t find something like that here in Austria… and I’d love to try this pie!! You would need 226.81 grams of butter, here is a great website that I use for conversions http://www.traditionaloven.com/conversions_of_measures/butter_converter.html. My crust came out more like cookie dough instead of crumbly. It is more soft. What did I do wrong. Kelsey, I am sorry your dough came out soft than crumbly. The only thing I can think of is that the dough was undercooked because their is no liquid in the dough mixture to make it “doughy” that will happen to dough if you add too much liquid but in this case their is no liquid added to the dough. How long did you bake the crust for? Randa, the brown sugar does not need to be melted, when you mix the brown sugar, flour and salt to the cream butter the mixture will be clumpy but that’s how you want it for a perfect crumb crust. Jen – Just looking at these bars make me wish Spring or even Summer is here! We have been having freezing temps here as well, no bueno. Wow these bars are star studded! I also am dreaming of the beach and a fruity drink and probably one of these bars in my hands!